Tyler Transportation provides transportation services to and from all 48 contiguous United States. We have the ability to handle all your transportation needs including Load to Ride, LTL, full truckloads, dry or temperature controlled, import/export containers, and airfreight. We have dedicated fleets with complete controlled dispatch. We assure professional, on-time delivery of your goods, and we keep everything running smoothly with our high-tech computer database, conscientious staff, and long-standing relationships with many reliable trucking companies. We also promise big-company reduced rates but with small-company personal attention. 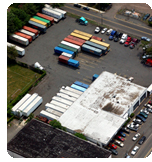 Tyler Transportation is conveniently located at 315 North 14th Street, Kenilworth, New Jersey. We are centrally located near all major airports, marine terminals, and highways in New York and New Jersey. We maintain a 3-acre facility, which is completely illuminated, fenced in and paved. Our 26 door cross-dock facility is ideal for distribution or swing loads. We specialize in stripping, shrink wrapping, palletizing, labeling, and export stuffing. Security is present 24 hours a day, 7 days a week as well as closed circuit camera surveillance and video recording. © 2013 Tyler Transportation, LLC. All Rights Reserved.